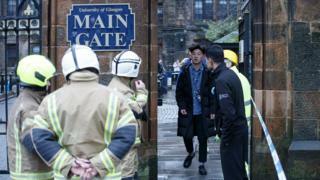 Classes have returned to normal at the University of Glasgow after a controlled explosion was carried out in its mailroom. Bomb disposal officers detonated a suspect package which had been found on Wednesday morning. Many of the university's buildings were evacuated and teaching was disrupted. Specialist police officers investigating the incident have linked it with devices found at three London locations. The university said it was acting under advice from Police Scotland when it closed a number of buildings, cancelled classes and sent staff home on Wednesday. The Boyd Orr Building, the mailroom, OTC, Wolfson Medical Building and Bower Building were among the areas closed off. Classes in these buildings were cancelled with hundreds of students affected. Confirming the link with the incidents in London, Assistant Chief Constable Steve Johnson of Police Scotland said anyone who sees anything suspicious should report it immediately. He said: "The package sent to the university was not opened and no-one was injured. A controlled explosion of the device was carried out this afternoon by EOD. "There are similarities in the package, its markings and the type of device that was recovered in Glasgow to those in London. "Therefore, we are now treating it as being linked to the three packages being investigated by the Met in London and both investigations are being run in tandem." On Tuesday three "small improvised explosive devices" were found at sites across London, the Metropolitan Police said. The airport said it would support the police investigation into the "criminal act". The force's Counter Terrorism Command is treating it as a "linked series" and "keeping an open mind" about motives. Police in Ireland are assisting the Met as the Heathrow and Waterloo packages had Republic of Ireland stamps. Irish Foreign Minister Simon Coveney said he was embarrassed at the possibility the packages may have come from Dublin. Appearing on the Independent.ie Floating Voter podcast, he said: "I read reports about that as it was breaking yesterday with dismay really, a combination of anger and embarrassment. "I think the perception in the UK of this will be one of bemusement, as to why anyone would want to send any small explosive devices into London from Dublin, the fact that that could happen and come from Dublin is something I and many other people will be uncomfortable with. "Everyone needs to isolate and criticise that kind of warped thinking for what it is, which is unhelpful on every level."